Wash the sweet potato then, using a sharp paring knife, poke four or five holes in it. Place the potato on a parchment paper or silicone lined sheet pan or baking dish and pop in the oven for 40 minutes to an hour. The sweet potato is done when you can easily poke into it with a fork. 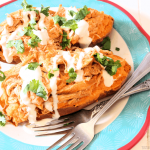 Meanwhile, mix the cooked and shredded chicken, hot sauce, garlic powder, onion powder, Worcestershire sauce, and liquid aminos or tamari together in a small bowl; set aside. Once the sweet potato is done, cut it in half then CAREFULLY (it will obviously be very hot) scoop out most of the meat from each half and place it in a clean bowl. Leave about ⅛ inch worth of meat in to prevent the skin from breaking. Using a fork or potato masher, mash the sweet potato meat. Squish in the cheese wedge and salt and stir until thoroughly mixed. Stuff the mashed sweet potato mixture evenly into the potato skins. Top each evenly with the chicken mixture. Return to the oven for an additional 15 to 20 minutes or until good and hot. Drizzle with the ranch dressing, top with garnish, and serve. You can cook the chicken while the potato is baking. To cook it, you can boil it in water (takes about 15 to 20 minutes), grill it, cook it in a pan, or cook it in the oven in a dish separate from the potato. Alternatively, you can buy an already cooked rotisserie chicken, remove the skin, and use one of the breasts.